Pretty Things: Announcing the Cover of my Book and the Participants! Woo hoo! I'm so happy for you Lori! I know you've been looking forward to this for a long time! I can't wait to get my own copy... and yes I want an autographed one! :-) And thanks to all the jewelry artists (go Zack!!) who contributed their beads, tutorials, and time. Here's to many more books by Lori Anderson! How exciting! Congratulations on your new "baby". BSBP has challenged and inspired so many of us to dream dreams, take chances and reach new heights in our beading journey. Thanks for all you did- and do-to make that a reality for us to share in. The cover looks fantastic Lori - can't wait to see the book completed. Congratulations!!! it looks awesome, I can't wait! Congratulations!! How exciting for you and the others. Zack - I bet you are a big help to your Mom! What a wonderful accomplishment Lori! Let yourself be filled with true joy and celebration for this huge milestone. Cheers! Here's a Hey and a Wow and a Yay from one proud contributor Lori. The cover looks great. And what an amazing group of people I have ended up hanging out with. I am so proud. You are an amazing force Lori! Thank you for everything!!!!! Oh that's so exciting, Lori! Congratulations on a really amazing achievement. I proud to know you and call you a friend! ~*YAY! *~ &&&& Very cool list of participants &&&& That the little guy is a part of it too! I am thrilled for you!!! I hope it is just the first of many books that you publish! Congratulations! Can't wait to see the rest of it! At long last, your dream has been fulfilled, Lori! Thank you for allowing me to participate in your adventure. Let's raise our plates of pie to many, many more adventures in your creative future! You must be really really proud of your accomplishments. Enjoy every minute of it. Congratulations! Oh, this looks positively yummy! Congratulations, Lori - job well done! Yay You!! I can't wait to order my autographed copy! Lori, your book looks awesome! The concept is so cool -- it'll really stand out from other beady books. I love that your son contributed. Hurray for boys who bead!!! Congratulations Miss Lori! This has been a long road and this is going to be a wonderful culmination of your hard work. It was an honor to participate and to be in such wonderful company! Can't wait to get my autographed copy. Congratulations, Lori! I am truly so excited for you! And, if Cindy was involved in picture taking, then the photos alone will be art! What a wonderful group of beading contributors you have assembled! I can't wait to see the final product! I'm so excited! I can't wait to get my hands on it! What a beautiful cover and I <3 the artists and contributors! I'm so proud of you! What an exciting day, Lori - to see this announcement about your book, complete with cover photo on your blog today! It has been a fun journey, sharing all sort of behind-the-scenes details with you and taking those bead bowl photos. 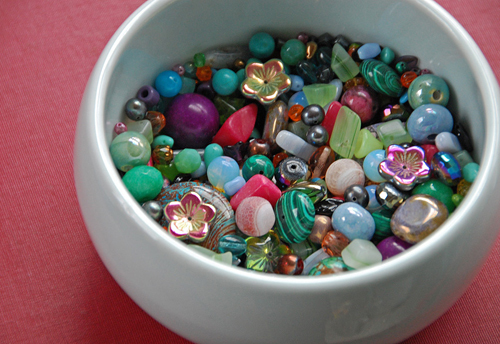 I have lots of memories of photo after photo of beads and bowls. Thank you for that opportunity and to contribute to your amazing book. I cannot wait to see it in print! Congratulations! Having a book published is such an achievement - for yourself as well as Zach :-). Really liking the cover - so colorful and pretty, i can't wait to see and read the contents. This is wonderful news! Congratulations, Lori and Bead Soup team! Looking forward to all the cool designs! so well deserved , you talented lovely girl!! Wow, can't wait to see the book and how it all turns out. Congrats. I'm jumping up and down with excitement! Congratulations on such a wonderful accomplishment! I can't wait to get my hands on one. And yes, I had to do a double take on Zack's name....how wonderful that he had a hand in making your dream come true! Congratulations! Can't wait to read/see it. Congratulations to you and all that participated in bring your book to reality. Congratulations on your book Lori!!! PS: I love that necklace in your header with the love across the heart. Really cool!! how exciting! love the cover, and can't wait to see the whole book. Congrats Lori! What an incredible cover - I'm sure everything inside is going to be fantastic and the lessons to die for. Bravo. Oooh I can't wait to get a copy of that book - autographed by you, of course. Congratulations! Looks fabulous! Congratulations on your upcoming book, Lori! So excited to get a hold of it. So excited to be a part of your book!! And I can't wait to see the finished pages, bound, and on the bookstore shelves. Super cool, Lori! Congratulations! I'm looking forward to the publication. Congratulations to you and the participants! Can't wait to get a copy. You should be very proud of Bead Soup; not only is it a brilliant idea but it has brought together so many people from different walks of life. New friends have been made, creativity explored and fabulous jewelry has been designed! All of these wonderful elements have enriched so many people's lives because of you Lori. You are an inspiration! The cover looks DELISH Lori. I'm so proud of all your hard work and seeing that it pays off in the end. Can't wait to see the final product! Congratulations to you and all those that contributed to making this dream become real! It is sure to be a fantastic book. Congratulations Lori. The cover rocks. The colors are so light and playful. It just makes you want to pick it up. I can't wait to see Zach's creation. I can't express my joy for you and what it means to me to be apart of this and a very talented group of people. Lori, that is so freaking cool! I hope I can get a copy over here. That´s wonderful dear Lori, I am looking forward for this book and if it is as great as the cover ... wohoooo ... it will be a delight and a feast for the eyes. Lori, it is wonderful. The cover looks so bright and fresh that I want to touch it. It must feel so good to have this enormous project off of your desk. Congratulations! Well done. Oh, wow, Lori! That is just wonderful news!!! You know I dibbie an autographed book! and I am so happy that Zack in now published:^) Loving you . Oh Lori, I'm sooooooooooooo proud and happy and just over the moon. The cover is awesome and to be a part of it is a dream come true. And that Zack is in the book - so cool. You and Zack just rock! CONGRATS!!! I can't wait to get it!!!! What an incredible idea! Love how far you've taken it! I know how hard you've worked to make this come to fruition and I know it will all show! I can't wait to get a copy in my hot little hands! Woohoo! It's so exciting to see the front cover. I can't wait to see all the tutorials. So brilliant that Zack is one of the designers. I'll definitely be looking for a completed - and autographed - copy! I'm so proud to have been a part of this book. I'm excited to see what everyone, including Zack!, came up with. And I'm really grateful to you, Lori, for inviting me to be a part of it!! cool! by the way, i'm a new follower, and hope someday, you'll be mine too! Congratulations! 1 more thing checked off your list! I can hardly wait for your book to be available...making room now. Thx to you and all the constributors for keeping us inspired! The highest of praises to all the participants...I can't wait to see it! Way to go writerly Lori!! Ya..excited for you ..way to dream and bring it all to fruition! Congrats on your book! Way to dream big and bring your dreams to fruition..you are paving the way for all of us to take courage and pursue our creative dreams and goals! Gorgeous, colorful, eye catching cover Lori! It had to feel incredible when you first saw this. You assembled a great mix of contributors for this project. Can't wait for it's arrival! Congrats in your book !!!! WOW! What a dream come true! At least I'm assuming it is, it would be for me. : ) I definitely want an autographed copy! : ) Can't wait to see it.